The Danger of Large Truck Jackknife Accidents | Hupy and Abraham, S.C.
Semi-trucks, tractor-trailers, 18-wheelers—whatever you call these types of large trucks, they share a common characteristic that puts them at risk of a specific type of truck accident. These large trucks have trailers that are separate from their cabs. The cab, where the driver sits, is attached to the large trailer in such a way as to allow the truck to move and to turn more easily than if the large truck was made up of one single unit. However, in certain situations this design can fail and the trailer may swing away from the cab of the truck in a way that resembles the movement of a pocket knife. These are called jackknife accidents and they are dangerous not only for the trucker but also for anyone else who is traveling near the trucker. Truckers drive too fast for weather conditions. 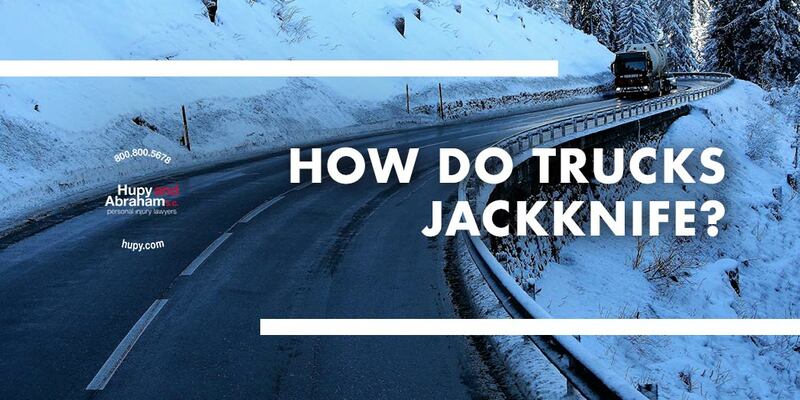 Certain conditions such as high winds, rain, and wet roads can make jackknife accidents more likely. There is improper braking. When a trucker brakes too quickly, or when there is a problem with the vehicle’s brakes, the tractor of the truck may skid and jackknife. Truckers are speeding. Taking turns or curves too fast can result in a jackknife wreck. There is unbalanced cargo. This can cause the tractor to be unstable. These crashes can cause the truck to collide with other vehicles on the road or cause other vehicles to crash with one another in an effort to avoid the jackknifed truck. If you’ve been hurt in a jackknife truck wreck, then a full investigation needs to be completed to determine who is at fault for the accident. Depending on the cause of the crash, it could be the trucker, trucking company, truck manufacturer, truck maintenance company, or someone else who should pay for your damages. An experienced truck accident lawyer can conduct this investigation and make sure that all of your rights are protected as you work to settle your claim or pursue a lawsuit. If you’ve been hurt in this type of truck accident, please contact us online or call us directly at 800.800.5678 to learn more about protecting your potential recovery.